The suspected shooter was discharged from the U.S. Air Force in 2014 and had been convicted of domestic violence. 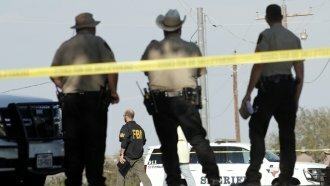 Some U.S. lawmakers are renewing their calls for gun reform legislation after the mass shooting in Sutherland Springs, Texas. At least 26 people were killed and another 20 were injured after a gunman opened fire during a Sunday morning service at a Baptist church. Officials said the suspected shooter, 26-year-old Devin Patrick Kelley, used a Ruger AR-556. That gun was inspired by the M-16 the military uses. The suspect served in the U.S. Air Force. A military spokeswoman for the branch said he was court-martialed in 2012 for assaulting his wife and child. He spent a year in military prison and was discharged for bad conduct in 2014. But when the suspect reportedly purchased the rifle in 2016, law enforcement told CNN the gunman didn't write on his background check paperwork that he had any disqualifying criminal history. It's unknown how the suspect passed the background check. The Gun Control Act says it's illegal to purchase a firearm if you've been dishonorably discharged from the military or if you've been convicted of domestic violence. It's unknown how the suspect passed the background check. The Gun Control Act says it's illegal to purchase a firearm if you've been convicted of domestic violence. An Air Force official told Newsy a bad conduct discharge wouldn't necessarily have barred the suspect from buying a firearm, depending on the specifics of the crime. The law also says a person "convicted in any court of a crime punishable by imprisonment for a term exceeding one year" is not allowed to possess a firearm. Although the suspect was court-martialed, his prison sentence did not exceed one year. The law also prohibits any person who is a fugitive, is addicted to a controlled substance or has been committed to a mental institution from possessing a firearm or ammunition. On Monday, Texas Gov. Greg Abbott said the gunman was denied a gun permit in the Lone Star State before purchasing the rifle in 2016. Correction: A previous version of this story implied that Kelley was dishonorably discharged from the military. He received a bad conduct discharge.